Objective:As laparoscopic surgical procedures increase in complexity, surgeons may find themselves with the laparoscope opposite to their laparoscopic instruments, thus creating the paradoxical viewpoint. 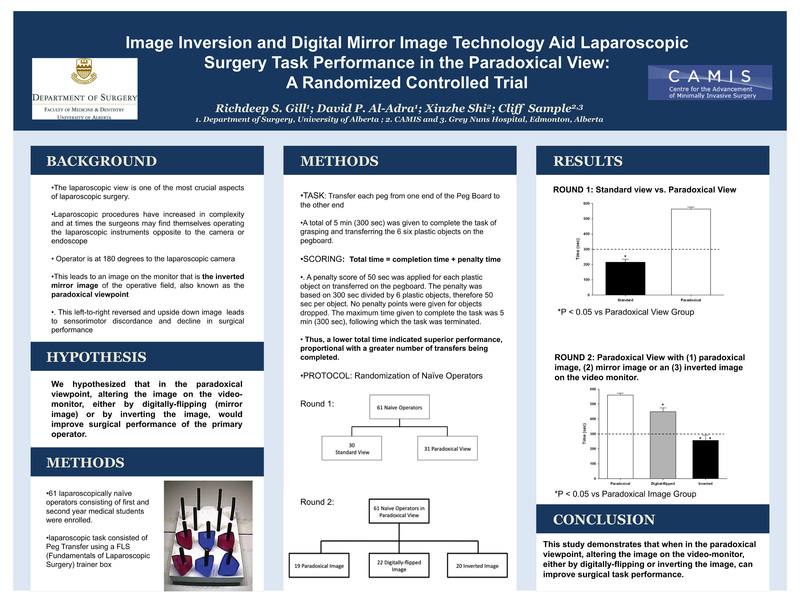 We assessed whether surgical task performance in the paradoxical viewpoint would be improved by digitally altering the image or by changing the camera orientation. Methods: 61 laparoscopically naïve operators preformed a Peg Transfer task using a trainer box according to the FLS (Fundamentals of Laparoscopic Surgery) program. In the first “round” naïve operators were block randomized to perform the Peg Transfer task either in the standard view (camera aligned with operator) or the paradoxical view (operator and camera in opposite 180o positions). In the second “round”, naïve operators were positioned in the paradoxical view and block randomized to having the monitor image as paradoxical (unchanged) (n=19), or altered by being digitally-flipped (mirror) (n=22) or inverted (camera upside down) (n=20). The Peg Transfer task consisted of grasping and transferring 6 small plastic objects in 5 min (300 sec). Scoring was based on total time = time to completion (max 300 sec) + penalty time (50 sec per peg not completed). We also assessed number of completed peg transfers in the allotted time. Results: In the first “round”, average total time to perform the Peg Transfer task using the standard view was 215 ± 20 sec, which was significantly less (P<0.001) than that for the paradoxical view at 563 ± 13 sec. The group utilizing the standard view completed 5.6 ± 0.2 peg transfers, which was significantly greater than the paradoxical view group that completed 0.7 ± 0.3 peg transfers (P<0.001). In the second "round" (with all naïve operators in the paradoxical viewpoint) the total time for the paradoxical image, digitally-flipped (mirror) and inverted image were 561 ± 12 sec, 449 ± 25 sec and 259 ± 37 sec, respectively. The total time for the inverted image was significantly less than both the paradoxical image and digitally-flipped image (P<0.001). The total time for the digitally-flipped image was also significantly less than paradoxical image (P<0.05). The group with the paradoxical image completed 0.8 ± 0.2 peg transfers, which was significantly less than both the digitally-flipped (mirror) and inverted view groups (P<0.05). The group with the digitally-flipped image completed 2.8 ± 0.4 peg transfers, which was significantly less compared to the group with the inverted image that completed 5.1 ± 0.4 peg transfers (P<0.05). Conclusions: This is the first study to demonstrate that when in the paradoxical viewpoint, altering the image on the video-monitor, either by digitally flipping or inverting the image, can improve surgical task performance.